Most people know that good grades will get you into college. And maybe if they’re good enough (along with an appropriate essay and the right extracurriculars and recommendations), they might get you into your dream or reach college. But while good grades may get you into college, chances are they won’t pay for it. This often comes as a surprise to students and their families but it really shouldn’t. There are 3 common situations where students aren’t going to qualify for enough academic scholarships to pay for college. 1. You think your student just has to apply for private scholarships to pay for college. 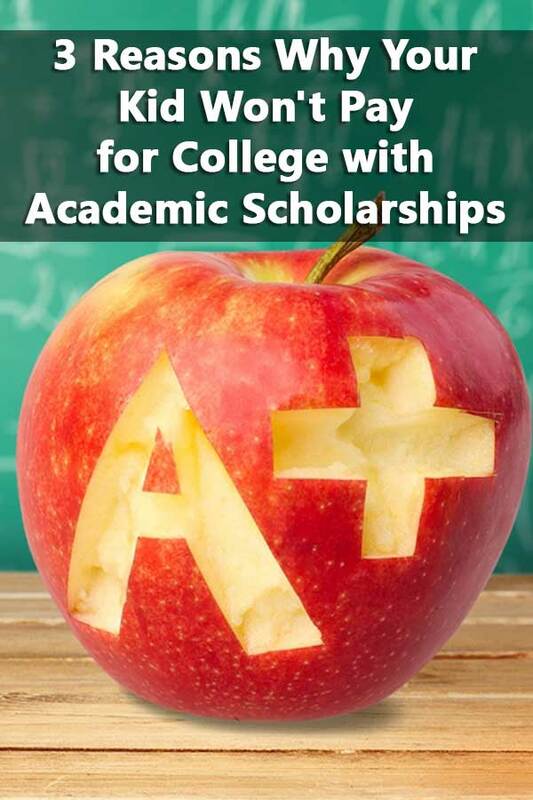 …if you’re really good you might win one out of every six scholarships you apply for. If you’re average you might get one out of ten. If your circumstance is unusual you might get a higher ratio, but typically if you want to win ten scholarships to pay for 90% of your need, you’re going to have to apply to five to ten times that many to win them. This means that students can expect to win about one out of every ten scholarships they apply for. And since most scholarships are for one year only, they’ll have to do this every year. The fact is that very few students manage to pay for college with private scholarships. 2. Your student’s academic credentials aren’t in the top 25% of freshman accepted at the college. 3. Your teen only applies to colleges ranked in the top 50 of US News Best College Rankings. I’m not going to get into whether or not the top ranked colleges actually represent the best college education possible. What I’m certain they do represent is popularity among high school students. These are schools everyone wants to go to, whatever the reasons. So the schools have their pick of students to fill their classes which is why their acceptance rates are so low. Therefore, these colleges generally don’t offer merit scholarships. Even if your teen is in the top 25% of academic qualifications, he’s not likely to get a scholarship. The reason is simple, he can easily be replaced with another student just as qualified. And let’s face it, when the lower 25th percentile of a class ranks in the 90th percentile nationally or higher, it’s pretty hard for students to distinguish themselves academically. Students and parents need to understand this, the most competitive colleges offer no or limited merit scholarships for students. They are not going to reward your student’s academic achievements except by allowing him to attend. Which students will get academic scholarships that will significantly help cut the cost of college? The students who get academic scholarships are those that apply to colleges offering money to convince them to attend. These are colleges where students who don’t break into the 85th percentile in national test scores, still have a chance to attend. These are colleges that are located in less popular areas. That means not in the northeast, popular urban areas, or on the west coast. These are colleges that don’t break the top 50 of national college rankings. In other words, the students who get significant academic scholarships do so by sacrificing prestige and name recognition for affordability.